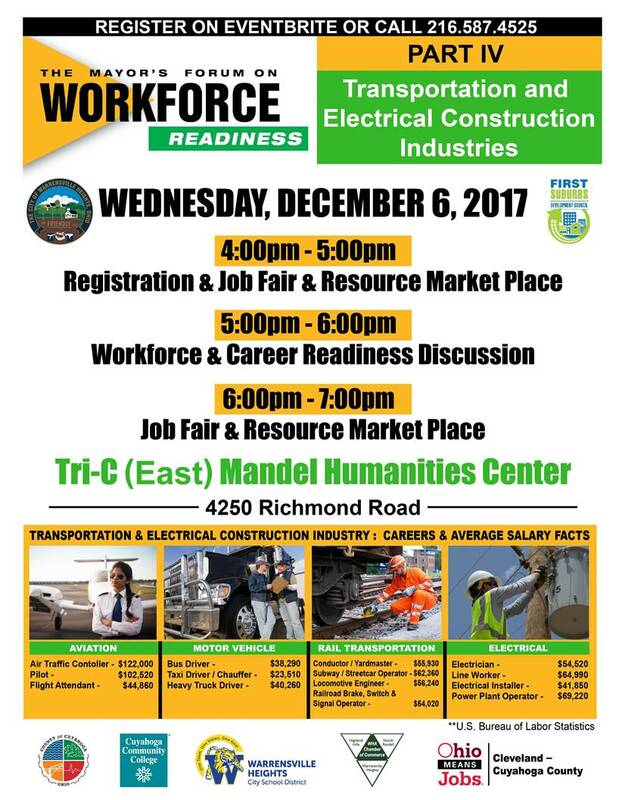 The City of Warrensville Heights and Northeast Ohio First Suburbs Development Council are proud to present the Mayor’s Forum on Workforce Readiness Part IV – Transportation and Electrical Construction in communities throughout Northeast Ohio! This event will feature giveaways, our signature panels of industry experts, a Job Marketplace where serious applicants will get the opportunity to meet premier businesses that are hiring, on-site resume reviews, FREE parking and admission, refreshments, and much more! For questions/concerns please call 216-587-4525. Wednesday, December 6, 2017 | 4:00 – 7:00 p.m.